Combined with a crackdown on unmerited high-level work visas and unfair trade practices, the order taps procurement specialists to propose contracting reforms to be assembled over 220 days by Commerce Secretary Wilbur Ross to create a “more muscular” Buy American policy, as a senior administration official told reporters Monday. Those older laws “require that when the federal government buys, builds or funds a project, domestic goods and products should be used,” the president said. Trump, who toured the tool plant with several key White House staffers and his Treasury and Education secretaries, spoke in front of an American flag made of colored wrenches. He said his order “sends a powerful signal to the world that we will defend our workers, protect our jobs and, finally, put America first.” He said agencies must root out a past policy gutted by excess waivers and reckless exemptions. 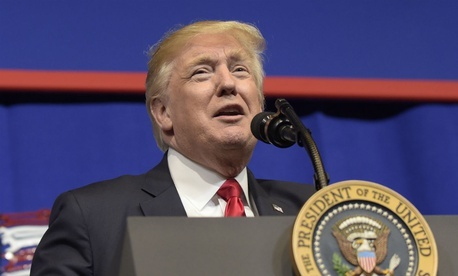 Trump had stressed the “America First Theme” during his presidential campaign, and in March 15 he traveled to Detroit to release guidance aimed at bringing more U.S. jobs to the auto industry. Reactions from the contracting industry blew hot and cold. “We like him putting the responsibility on each agency to delve into its own analysis of the impact,” Alan Chvotkin, counsel and executive vice president of the 400-member Professional Services Council, told Government Executive. He noted that how the Transportation Department buys products will differ from how the General Services Administration does it, and that information technology procurement differs from the purchase of commodities. The supply chain for many of today’s government requirements, including those for national defense, does not typically reside exclusively within the United States and thus is less readily influenced by the federal government than in the post-World War II years, he said. “Asking government to buy more like the commercial side at the same time is also more difficult, since ever-tighter management of the supply chain is required to ensure buy American provisions are properly implemented,” he added. Information Technology contractors expressed concern that the order would freeze technology, increase costs and stifle information. "Buy American sounds good and is well-intentioned, but it will only help America if it is applied in a manner that reflects today’s reality, rather than cut off our nose to spite our face," said Trey Hodgkins, senior vice president for public sector at the IT Alliance for Public Sector.